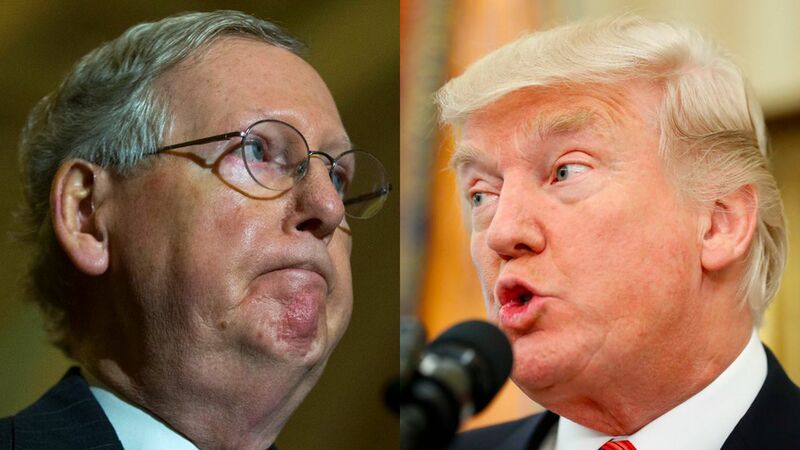 A new report in the New York Times revealed that President Trump and Senate Majority Leader Mitch McConnell haven't spoken in weeks — and McConnell has been telling people behind the scenes that Trump is "unwilling to learn the basics of governing" as his administration approaches the point of no return. The flash point: The Senate's failure to pass health care reform led to a "profane shouting match" of a phone call between McConnell and Trump. It also alienated other GOP senators, as West Virginia Sen. Shelley Moore Capito was refused a seat on Air Force One after refusing to commit to a repeal vote. Why it matters: The GOP's hope for achieving meaningful reform —involving health care, taxes, or infrastructure — rests on Trump keeping an open line of communication with congressional leaders. The more that he poisons that well, the more he risks kneecapping his own agenda.